Kerry Blue Terriers have muscular, medium-sized, sturdy frames covered in soft, thick, wavy coats that are usually gray, slate or blue gray with possible patches of black. Their long heads have small, dark eyes, folded V-shaped ears, and (usually) beautifully trimmed beards. They have long necks, short backs and medium-length tails that are carried high. 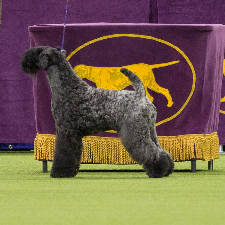 Overall, Kerry Blue Terriers look balanced and full of character. Kerry Blue Terriers form very close relationships with their families. In fact, they will sometimes follow their owners around the house to show their love, affection and sense of loyalty. Natural herders and protectors, Kerry Blue Terriers make superb watchdogs. These dogs are sweet, gentle and amazing with kids. Keep in mind, however, that Kerry Blue Terriers can be strong-willed. Consistent, positive training is necessary with a Kerry Blue, not to mention generous helpings of attention and togetherness. Kerry Blue Terriers can live as long as 15 years. Common health issues include hip dysplasia, immune system disorders and flea allergies. This breed requires a certain amount of beautification. Not only does the Kerry Blue Terrier’s dense, wavy coat have a Velcro-like effect with twigs, grass and burrs, but it also needs professional trimming to stay in shape. The good news: They don’t shed very much at all. Don’t forget weekly brushing and bathing, and trim their beards occasionally—they tend to get messy during mealtimes. Named after Ireland’s County Kerry region, the Kerry Blue Terrier was originally developed to hunt and retrieve small game across British fields, lakes and streams. Kerry Blue Terriers served as tireless working dogs for centuries, herding sheep and cattle, but they eventually hit to dog show circuit once English breeders realized the handsome potential of a groomed Kerry Blue.